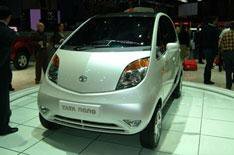 Tata Nano | What Car? Make no mistake: the world's cheapest car was also the most popular exhibit at Geneva. Crowds flocked around it for hours after the launch, including masses of engineers from rival car makers. The good news, then, is that company officials say the Nano is destined to go on sale in Europe. True, it may cost considerably more than its 1277 asking price in India, but it is still expected to shake up the budget end of the European market in about four years time. In its current form, the four-door Nano is shorter than a Mitsubishi i and can seat five people, but there is no air-conditioning, power steering or electric windows. Powered by a rear-mounted, two-cylinder 624cc engine developing 33bhp, the car is capable of 68mph and 57mpg. However, the lack of the mod-cons, as well as the need to pass more stringent crash and emissions tests, may force some changes for the European version of the car.